This is something that's been sitting in my drafts for a long time. I'm not sure why I never posted it back when it was current, but I'd like to share it now in the hope that someone somewhere might learn something from it about the value of independent retailers. 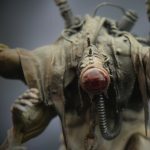 It's a lesson that can be carried over to far more than Games Workshop/Model retailers. I've applied similar logic to my book purchasing. I only buy books from my local shop these days. Never from Amazon. You have all, of course, been talking about it for years: how your FLGS's have been closing up shop and moving on: how discount online retailing is dropping long-ranged, SCUD missiles on the Mom-and-Pops. Well, yesterday I woke up. I opened my ears and finally listened as I drove by my local independent model retailer from my teenage years and discovered that it was gone. Since the Sentry has now closed down, I'm not sure if you're still checking this email. Hell, I'm not even sure of your name despite having talked across the counter to you in brief interactions for more than ten years. However, my name is Mr_Pink, and me and my brother Brother_Pink were on-again, off-again patrons of the Sentry even since you opened in Leaside in the late 90s/early 2000s (the off-again periods having more to do with stints at school in Waterloo, at work in Japan, or at odds with Games Workshop and its often downright evil business practices). I know that when we were young we took the Sentry for granted. We'd pop in when we were in the area or when we couldn't make the full trek down to Games Workshop. You were quiet, unassuming, and--generally speaking--exactly the kind of person with whom one would want to interact in a model store. But, like I said, we took this for granted. We kept splitting our business between the Sentry and Games Workshop, and then, eventually, between online, discounted retailers as well. We were a little older, but still young and still foolish, and we thought the cheapest price meant the best retailer. Eventually the used-car-salesman-like attitude of the Games Workshop sales clerks got under our skin. We got sick of how all they wanted from you in terms of conversation was enough key info to sell you your next model. 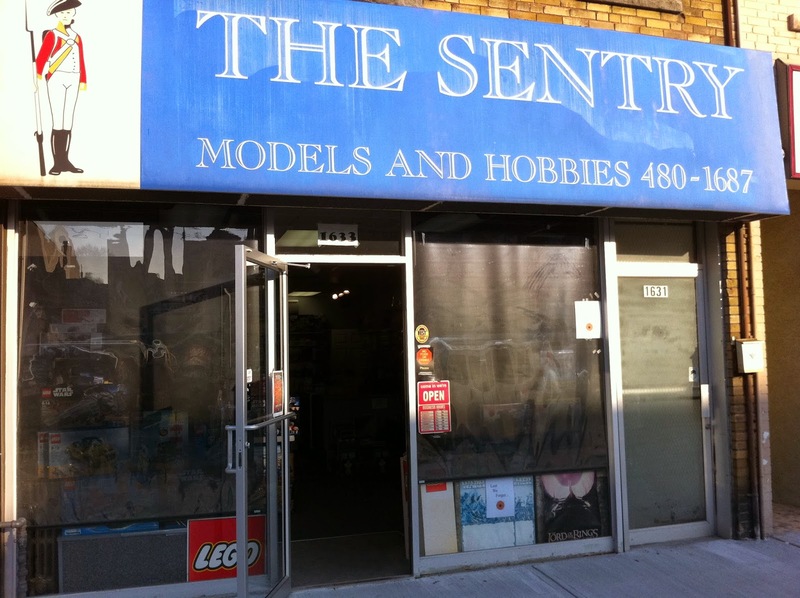 Eventually our busy lives lead us to believe that there wasn't enough time to make it out to the Sentry as we moved away from Leaside, and that the most convenient option was purchasing from online retailers. Thankfully, somewhere along the line we actually grew up. My younger brother figured it out faster than me (as is often the case). He began to make a point of buying as many models as he could from you directly because he valued you, and your demeanour, and your shop, and he wanted to make sure he helped to keep you in business. 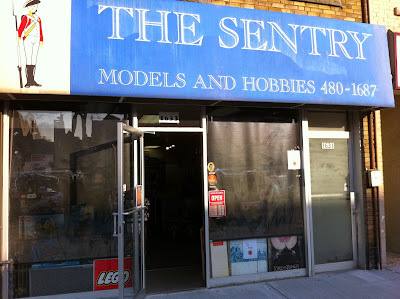 It took me longer to smarten up, and just yesterday as I was driving down Bayview, I got back into that familiar neighbourhood and thought "if I'm going to buy these new, rumoured Tyranid models from anywhere, the best place to buy them is probably The Sentry." And then I turned to my left and looked into the cavernous space that had once been the Sentry. And my first thought was "I'm too late." So I'm sorry that I didn't come into the shop and say all of this to you in person, while the shop was still open. I'm sorry that this has to take the form of a eulogy, rather than a customer testimonial. I hope that you are receiving a lot of emails like this. I hope that some people actually succeeded in saying them to you in person, over that counter, while the store was still open. Thank you for being a very significant part of my childhood. Thank you for making Leaside a slightly more interesting place. Thank you for all your hard work, and if you ever for a second wondered if it was appreciated, please wonder no more. It was, and it always will be. PS: I'm not sure if you'd be interested, but in case you were, here's what I managed to accomplish with some of those models you sold me over the years: http://modernsynthesist.blogspot.ca/"
Turns out his name was Joe, and he is probably the most consistent face I've ever seen retail-side in all my years of miniature wargaming. Anybody have similar experiences related to independent retailers? They definitely don't have to be as morose as my own and could talk about how they're still alive and kicking and the best parts of your days. When I was younger, there was a hobby town or hobby world (not the main chain) by me, run by an older gentlemen. It was full of plastic model kits. You name it, he had it. He had so many in beautiful display cases, flawlessly executed and painted. Later I found out those were the models he actually built and painted, and proudly displayed in the store. Thanks for sharing your story, Greg. I can definitely empathize. The saddest bit tis that you would probably have given some of those finished model kits a really loving home. I only got a chance to go to the Sentry twice before it shut down. I remember when I found it thinking, 'sweet, an independent model shop in walking distance from my apartment'... then on the third visit it wasn't there. In those two times that I did go though, the owner seemed pretty cool and had some good advice (I think I asked him about matte spray on varnish or something). Thanks for posting, VVD. I'm glad someone who has actually been to the Sentry saw this. 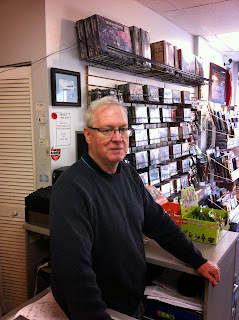 The guy behind the counter was really soft spoken and unassuming, but really kind. When I first started Warhammer I was in middle school. A friend of mine introduced me to a shop in a nearby mall (Fairview in Toronto). Now, I was an immigrant and a loner. Most shopkeepers in the area only cared about my money and if I was trying to steal stuff. I was awkward and introvert. I thought I'd just run in, grab a few models, hand the money over and run out. Everyone in the GW shop was hospitable and seemed to loved me for just being there, even though I was just barely a teenager (literally, I was 13 at the time). One of the dudes, a man named Andrew, always made time for me; whether it was showing me how to paint or trying to squeeze a game in for me when there's no one else around. Which made it all the more heartwrenching when they did eventually close down due to GW downsizing their Canadian branches. As sad as I was, it was out of my hands. So I started looking for other shops, local shops, that carried Games Workshop. I found a location called Gryphon Games, a local shop just 10 minutes by car from my home and they also offered a decent discount on GW products. I was exploding with excitement, and it only got better when I stepped into the store and saw the staff. It was Andrew, and everyone from the old GW store. They had taken their own money and opened their own gaming shop. Andrew wasn't just a clerk anymore, he was the owner. They had a basement filled with tables and a full range of not only GW stuff, but also of every other miniature line there was (this was a rarity back then, few people carried non GW, Non privateer press minis because of the inherent risk of them). A lot of my armies came from Gryphon Games, as their discount made it a lot more affordable, especially for a highschool student still on an allowance. But all things must end, and due to my education I had to move out of town. It would be two years before I could return again. And it was a sad and depressing return. At college I had found a lot of people into warhammer, which kept me going despite not having anywhere to play. So when we came back I wanted to show my friends the shop that had all the deals and the coolest staff on the planet. But when we arrived at that old crossroad, I saw a flower shop in it's place. It was gone, sold. As I didn't really start using Facebook and messengers until College, I never kept much contact with Andrew, which made it all the more shocking to know that they've closed down. The website they had was taken down, there was nowhere I could find anything about them. it's as if the shop never existed. Andrew had a wife and a kid, and as far as I knew he was the sole breadwinner for the family. He had the dream job and he made it wonderful to buy and play there. And in just a few years he was gone. I don't know what happened to him, I pray he's ok, because he deserved that job and the happiness it brought. I hope, even half a decade later, that he simply moved shop again and changed the name, because the alternative is, to be frank, downright horrifying to think about. WAIT. FAIRVIEW? TORONTO? We're neighbours! Thank you sooo much for sharing your story, Black Obsidian! I really found it inspiring that the GW employees had struck out on their own. I feel like I've heard of Gryphon Games, but I'm sad I never got in there. And I'm sorry that I'm not sure how to advise you track him down. You could try heading to the GW store on Yonge at Lawrence and asking them if any of the staff have been around for a few years and know any of the people who used to work at Fairview....?